Dragon Sharm and Edith the bear discover love’s heartache and what it means to be a true soul mate. 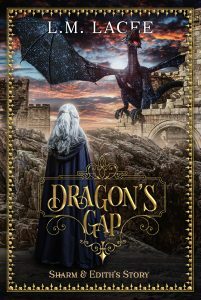 This is the second fantasy dragon romance book in the series ‘Dragon’s Gap’ where we meet Edith Black who is a full bear that grew up thinking she was human. Edith is a bear that, for so long, could not shift or communicate with her other half. After she has been at Dragon’s Gap for two months this all changes so whether it is the influence of all the other shifters or the Dragon magic that fills the air, Edith’s bear starts to talk to her. Now shutting her up is the problem! Her bear has an opinion on just about everything, especially if it has anything to do with Edith’s life. She has discovered her bear is grouchy in the mornings and not so grumpy in the afternoons. Although Edith will admit she also can be short tempered and on occasion can be sharp tongued. But usually because people can be just so annoying! Edith learns her bear gave up the ability to shift for other gifts, one of those being the ability to tell the species, age and birth date of any person or child. A valuable gift at Dragon’s Gap when so many young do not know who or what they are.